As a business owner or commercial property manager, you already know the benefits of automatic door closers. They serve as a security aid, help to save energy costs, and keep dirt and pests from entering your building. They’re a great feature for your doors ensuring proper security and safety. When entrusting something as important as building security to a vendor, you want to make sure that it’s one that is licensed, bonded, and insured to protect your building not only against intruders, but accidents as well. Locksmith Bee is the quality company with Commercial Locksmith services you want! Since the doors themselves on which the installation will be performed can affect the outcome, our expert technicians will start with an inspection. We’ll check the door openings and the doors themselves for structural integrity and warpage before work even begins. If we see problems, we’ll inform clients, and let them know what their options are. Surface-mounted door closers come in four variations: slide-track arm, regular arm surface mounted, parallel arm surface mounted, and top jamb mounted. Overhead door closers are typically surface mounted. 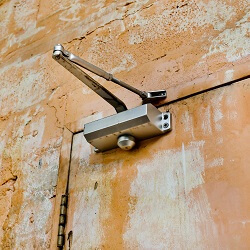 Such closers mount inside a pocket in the door frame or are mounted in the floor directly under the pivot point and are completely concealed.While the amount of maintenance done on such doors varies depending on traffic, routine maintenance is vital. If you know you want an automatic door closer to protect your business than you know which locksmith service you should call. You want the one with 5+ years of experience in all lock matters, with fast and friendly service and upfront pricing, Locksmith Bee!